﻿ Nonprofit Fundraising, Part 1: How to Plan Your First Successful Event » Red Mango Marketing! This post is the first in a three-part nonprofit fundraising series. Get more tips during our FREE webinar: How to Communicate with Supporters Before, During, and After a Fundraising Event with nonprofit expert, John Haydon. Even if you have the cause, idea, and enthusiasm needed to run a successful fundraiser — pulling it off is easier said than done. How can you make sure your fundraiser goes off without a hitch? No matter how big or small your fundraiser is, there’s one thing you can always attribute to successes. The first thing you must do is plan well ahead of time (at least three months) so you have time to line up the key ingredients for your first event. What type of event will you hold? You want to throw a fundraiser that is fun for your audience and draws a real crowd. Think of events people would want to be involved in and share with their networks. Timely events are often the most popular. 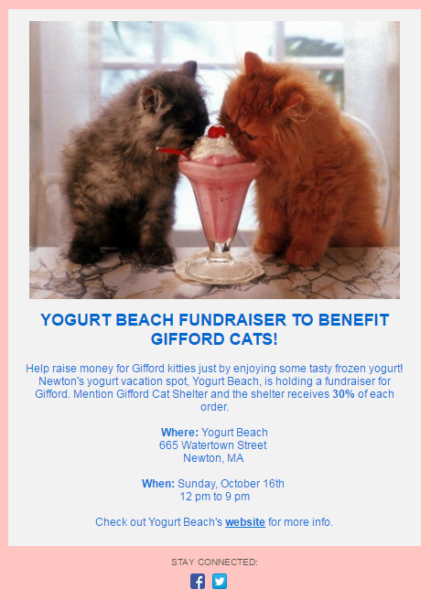 Gifford Cat Shelter, for example, organized a fall fundraiser at a local frozen yogurt shop, so guests could enjoy a cold treat before the winter weather set in. When and where will you hold your event? The good old adage of Location, Location, Location is also an important thing to think about. The venue helps get people excited about your fundraiser. Remember, you’re competing with other organizations looking for a great venue, so you want to lock down a date and time at the venue of your choice as early as possible. Who can you get to sponsor your event? The short answer is anyone and everyone. Start with your company, local businesses, and ask your registrants if their companies want to get involved. Beyond that, reach out to local restaurants for gift cards or food donations. Remember, companies use this as advertising. Treat this like a business opportunity for them. Are you going to need prizes? Prizes and cool interactive experiences really get people excited and donating more money. Ask you sponsors if they can donate any giveaways. Don’t forget to check with the venue either. They may donate gift cards or have something else to offer! Be creative and customize the prizes towards your cause. Is there going to be food? People love to eat. Whether it’s breakfast (an easy buffet will do), lunch (keep it easy and flexible for a wide variety of diets), or dinner (people will always remember a good dinner.) Local area restaurants are perfect candidates to cater your event. This is a great way to get them some nice publicity. Look at food like you would sponsorships. You want quality at a discounted, if not free, price. Will you need volunteers? Volunteers are important and will save you money. Reach out to friends, colleagues, and family members. Make sure you use email marketing and social media to not only reach your contacts, but also to leverage your fans’ and followers’ contacts as well. Inform people of the cause and ASK for help. Asking is a powerful thing! Planning your nonprofit fundraising event is both an exciting and overwhelming time. Start your planning process well ahead of time (at least three months out!) and follow this simple rule: keep your event fun. Once you have the date and location settled, start building excitement by sending a Save the Date email to your email list. Using a professional email template, like the one below, makes a great first impression and shows your supporters that your event shouldn’t be missed. 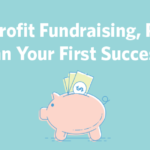 The post Nonprofit Fundraising, Part 1: How to Plan Your First Successful Event appeared first on Constant Contact Blogs. This entry was posted on Monday, May 15th, 2017 at 8:00 am	and is filed under Event Marketing, Featured, News & Updates, Nonprofit. You can follow any responses to this entry through the RSS 2.0 feed. Both comments and pings are currently closed.